Wisdom teeth are the third set of molars that most people get in their late teens or early twenties. Although the exact rationale behind the term "wisdom teeth" is unknown, it is thought that the third molars were given their name because they erupt at a time when a child becomes wiser, as they enter adulthood. The average person will develop four wisdom teeth and more often than not, wisdom teeth are misaligned and require removal. When these molars are misaligned they may be positioned horizontally or be angled inward or outward. This can crowd or damage other teeth, the nerves or jawbone. Wisdom teeth can also become impacted and cause many unpleasant symptoms including pain to the jaw and side of the face, swelling, headache, and bleeding gums. Impaction occurs because the wisdom teeth are usually the last teeth to emerge and there is often little room or space left to accommodate their size and anatomy. During your dental checkup at Dental365, your dentist may take an orthopantomogram x-ray, also known as a panorex, to diagnose whether or not your wisdom teeth need to be removed. The panorex gives your dentist a clear view of the area directly around the wisdom teeth, to determine the type of extraction necessary for each individual wisdom tooth. 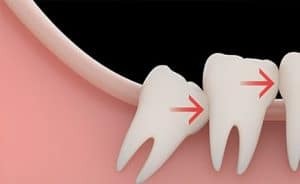 If the dentist discovers a reason for you to have your wisdom teeth removed he will access the position of the wisdom teeth and how each root is formed. Depending on his findings, your dentist will make the decision to perform the wisdom teeth extractions for you, or have one of our in-house oral surgeons perform the wisdom teeth removal. If you or your child are approaching age 18-20 and are wondering if you have wisdom teeth or if you need them removed, please call 844-365-DENTAL to schedule a consultation at the Dental365 office nearest you. Our friendly team of dental professionals will be able to address all of your concerns or any pain you are in and make sure you are on the right path to keep your smile healthy and beautiful.